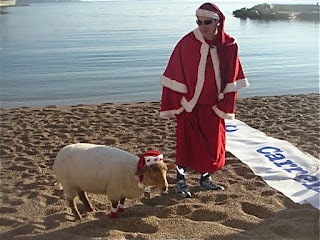 Readers of Menton Daily Photo will have met Woolite, the sheep before. She is the mascot of Les Foulées Roquebrunoises and runs with the group and swims in the sea - always with her proud owner, Philippe Mazza. Thankyou, Philippe (who you see in the smaller pic) for both photographs. Taken just before the 4th Bain de Noël on Christms Eve at Larvotto Beach, you see Prince Albert in the centre of the photograph, wearing sunglasses and green shorts under his Father Christmas robe. The swim was in aid of TATSA (Thai After Tsunami Schooling Aid). Woolite was proud to swim in the sea in such exalted company. This was reported live on television - to view the video, to see everyone including Prince Albert, swimming in the sea and to hear the Prince speak, click on the link. To see Woolite swimming in the sea please click on this link. Let's have a glass of mulled wine before we start exploring the Christmas Fair. It's cold - we need it. We're still in the gardens and looking down, this time on the Fragonard perfume factory. This is a branch of the factory in Grasse, a town famous for its perfumes. This factory makes soap and face creams - the perfumes are made at their main branch in Grasse. The main photograph shows the shop at the entrance to the village. The smaller photograph shows the factory which is way below the village. You can take a tour - it's great - you learn about perfume making, and you can buy their products which are very good. I was amazed at how popular this tour is. Many visitors to Eze come, not only for the beauty of the village and the gardens, but to visit Fragonard. Click on the link to read more. Only two small areas of an imposing castle built on top of the rock of Eze now remain. Built in the second part of the XIIth century by the family of Eze. It belonged to Provence and the fortress was guarded by the Castellans. In 1706, during the war of succession of Spain, Louis the XIV ordered the destruction of the castle on the recommendations of the Minister for the war : " Sir, the King having seen the strategic situation of the castle, between Villefranche and Monaco, His Majesty the King gave me the order to destroy this castle, in order to be able to preserve this communication ". What you see in these two photographs is all that remains. The history of Eze though, goes back much further as fragments have been found proving that Eze was inhabited as far back as the Iron Age. An added joy of visiting the Jardin Exotique is the view - here we are looking down on the Château Eza, one of the two fabulous hotels in the village. The other is the Chèvre d'Or which is slightly further down the village. The gardens are beautifully laid out as you can see in the small 'plan' on the left. Some plants, furry and spikey at the same time, are extraordinary. The plant in the foreground above is called Cleistocactus Strausii and originated from Bolivia and Argentina (see close-up below). A plant is called a succulent when it stores water to withstand dryness. The Garden of Eze has succulents from Africa and America that are well-adapted to arid climates. The water is stored in the fleshy parts - mostly the leaves and stems. These plants developed tricks to limit evaporation: smooth skins, sometimes covered with wax, hairs and thorns, instead of leaves. Many succulent plants, cacti and sisal (agaves) in particular came to Europe at the time of the great Discoveries. The first cactus is believed to have been brought back by Christopher Columbus but it was not until the Renaissance that these plants were studied and understood. The first sisal (agave) was imported in the XVIth century and when it blossomed, it was several metres high and was considered quite a marvel at the time. General Weber, a member of Maximilian of Austria's expeditionary force in 1865, was one of many to whom we owe the presence of agaves on the Riviera. Today, cacti, agaves, aloes and euphorbias are a fundamental part of the Riviera landscape. At the end of the Second World War, the current mayor arranged for soil and stones to be carried to the top of Eze village and placed around the Roman ruins (we will see these later) and with the assistance of Jean Gastaud, the founder of the Exotic Garden in Monaco, they created the Jardin Exotique of Eze. We're back in Eze village ready to visit the Jardin Exotique which is at the very top of the village. This is a photograph I took in the summer. We've parked at the level of the road you see bottom left - so you can see, by the time we reach the top of the village, we've walked quite a way. Time to leave le rocher - one last look at the battlements - just below Fort Antoine - as we walk down towards the car park. In the distance you see Cap Martin and beyond that, Italy. Little girls are little girls, even if they are royal. Here you see Princess Alexandra with her mother, Princess Caroline - the eldest of Prince Albert's two sisters. Red stockinged foot through the balustrade, watching the excitement below. In the smaller photograph you see Princess Alexandra with her father Prince Ernest August of Hanover and her half sister, Charlotte Casiraghi. Both photographs taken by Maggie Calkins - thankyou Maggie! 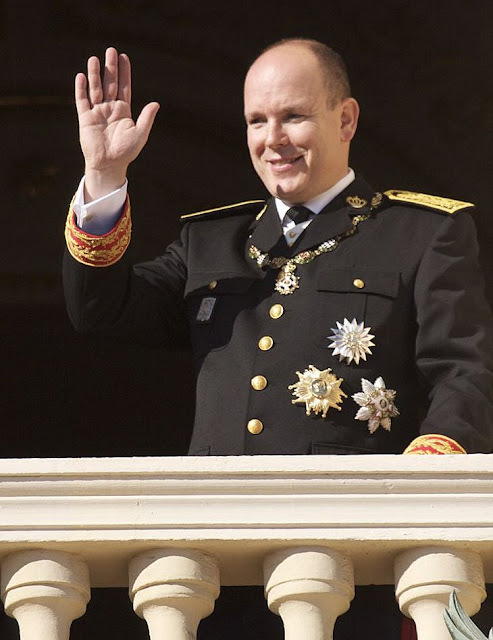 Here is Monaco's much-loved, Prince Albert waving at the crowds. This photograph was taken by my friend, Maggie Calkins, a professional photographer. She has a Canon EOS 40D. I didn't know, at the time - (as Maggie did) - that the crowd rush forward and stand below the balcony - see yesterday's photograph. I'd stayed on the Press Stand. None of my zoomed shots are sharp enough. I ran forward too late and the one below is all I got. Taken in a rush and as you see, not remotely of the quality of Maggie's. You see Prince Albert with Princess Stephanie on the right. 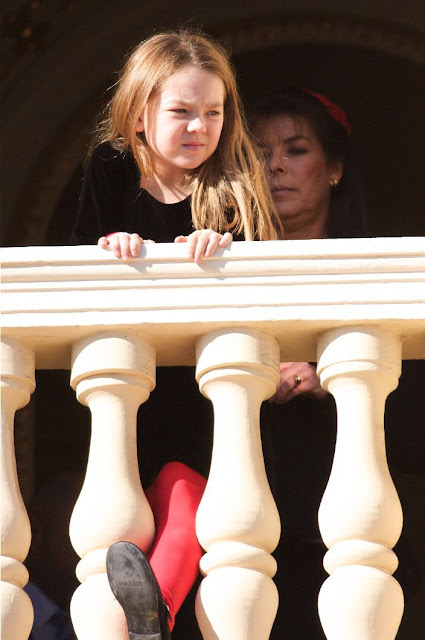 In the background, their nephew, Pierre Casiraghi, the son of Princess Caroline. 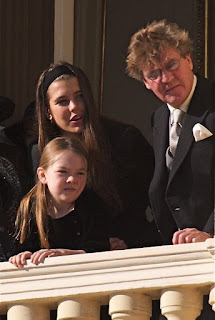 For anyone who doesn't remember, Albert, Caroline and Stephanie are the children of the late Prince Rainier and Princess Grace (formerly Grace Kelly, the American actress). Tomorrow - more of Maggie's photographs of the Prince and his family. Thankyou, Maggie! Probably the most moving moment of the Fête Nationale is when the barriers are pulled back and the Monégasque citizens and residents are allowed to surge forward, wave their flags and cheer their Prince. Tomorrow we'll see some close-ups of the Prince and his family. Displays - marching - music - police, soldiers, firemen - lots of colour, lots of noise and a very enthusiastic crowd. A small (and young) part of the crowd waiting for Prince Albert II and his family to appear on the balcony.